| step one | Start by sketching the leafs, you will have to do three different sizes for the white leafs, a 1 1/2 inches (19 pieces), a 2 1/2 (38 pieces) and a 3 1/2 (40 pieces). The 2 1/2 and the 3 1/2 sized leaves will need double the amount because you will need to adhere one to the other so that you have a thicker leaf. This will allow for a more sturdy wreath and you will not have a sticky side left on the back of the leaf. | step two | Begin to cut all the leafs out from the felt sheets. | step three | Begin to adhere the 1 1/2 inch leaves to the 2 1/2 inch leaves, here is where you will need to do half of the leaves facing one the opposite direction of the other half, so when it's time to place it on the wreath they all face in an upward direction. | step four | Once you have adhered the small to the medium leaves to each other, begin to adhere the the 2 1/2 sized leaves together and the 3 1/2 sized leaves as well to create a very sturdy leaf. | step five | Then you will also sketch the green leafs , those are 3 inches (6 pieces), the red berries ( 3 pieces), those are a quarter of an inch, the white stripes (9 pieces, for the green leafs), and those are also a quarter of an inch. Also, repeat step four for the green leafs only. | step six | I failed to take a picture of the vine alone when I created it, so bare with me here. In this step, you will create your wreath, this is easy, you just have to work with the wire and coil as you go. Leave a 4 1/2 inch vine out like pictured. The size of my wreath just from the grapevine is 12 inches, and including the leafs 15 inches, but you can make it bigger or smaller depending on what you want. Note: you will have to adjust the leaf size according to the size of the size of your wreath. | step seven | Adhere the white stripes and red berries to the green leaves, once you finish with that, glue the green leaves to the wreath and let it set for an hour. Note: the 4 1/2 inch vine that is left out is for the placement of your clip on birds. | step eight | Begin to create your desired placement of the leaves. I placed the large leaves facing downward, the medium leaves facing upward (not like the picture, was just testing the look), and the small leaves upward adhered to the medium leaves. | step nine | Once you have your placement figured out, begin to glue the leaves, first comes the large leaves, which you'll let it set for about an hour, and then glue the medium leaves onto the large leaves and let it set for another hour. When you get to the top of the wreath with the large leaves, place your ribbon through a vine and tie a knot at the top before you finish connecting all the leaves. Once you've finished gluing and setting, clip the birds on the vine and your done. Hope you liked it, it ended up being a little bit more time consuming then I thought, but the end result was so adorable that it was worth to me, because there is something to be said about making your own decorations. 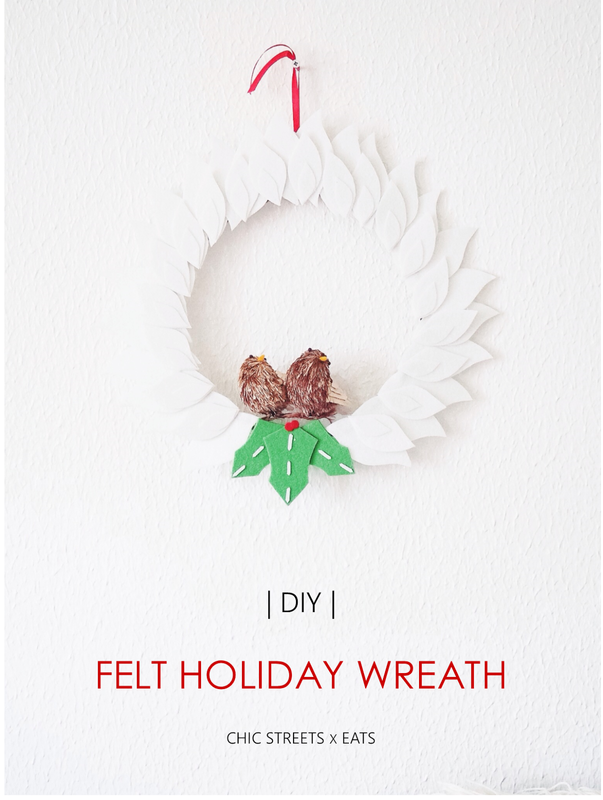 Also, see last year's Holiday DIY (HERE) that I did in collaboration with Sprinkles in Springs, and Let me know what you think of this year's wreath. Just stop it! This is so precious. Hehe so happy you think it's precious! I think so myself :).